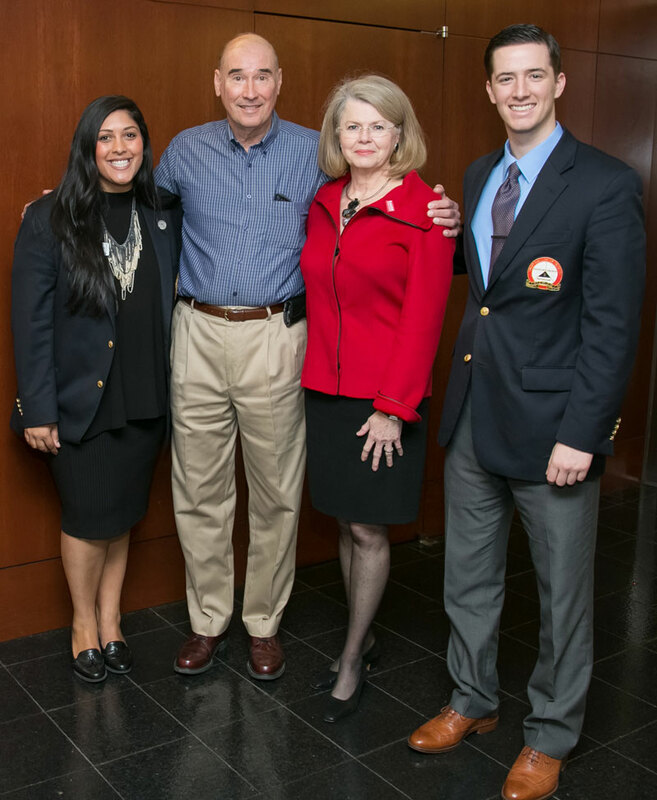 Andy (BBA ’68) and Barbara Gessner (center) have made a gift to support students in the Program for Excellence in Selling with The Andy and Barbara Gessner Sales Program Top Salesperson Awards and the Andy and Barbara Gessner Competition Team Endowment. The C. T. Bauer College of Business at the University of Houston announced today that Andy (BBA ’68) and Barbara Gessner have made a gift that will support two student initiatives in the college’s Program for Excellence in Selling — The Andy and Barbara Gessner Sales Program Top Salesperson Awards and the Andy and Barbara Gessner Sales Competition Team Endowment. The Top Salesperson Awards will recognize both individual and team student success, and the Sales Competition Team Endowment ensures ongoing and regular learning opportunities backed up by the rigorous research and planning that precedes the challenging sales competitions. Students in the Program for Excellence in Selling have a history of winning and performing well at the national level. Since the program launched in 1996, students have brought home wins in the National Collegiate Sales Competition, State Farm Sales Competition and other national and local sales competitions. The Program for Excellence in Selling operates within the Stephen Stagner Sales Excellence Institute at Bauer College. This program, designed to give students real sales experience, includes more than 185 hours of live sales training within five courses. Admission into the program is selective and competitive, with an average of 75 students accepted each semester. "WE ARE VERY GRATEFUL TO THE GESSNERS FOR MAKING SUCH A HUGE DIFFERENCE IN THE LIVES OF OUR STUDENTS." Gessner, a native Houstonian with a street named after his family, and a professed “peddler,” joined Industrial Air Tool (IAT) in 1979. IAT was founded in 1966 to repair pneumatic tools for the oil and chemical industries. Today, IAT is an industrial distributor carrying over 20,000 different items in inventory and representing 700 manufacturers’ products. Gessner has actively managed the company through many industry cycles and through various equity partners. He has been involved with buying and selling the company several times. Barbara, originally from Ohio, is a graduate of Texas Woman’s University. While raising their daughter, Barbara was an active school and community volunteer and supported Andy in his career. They are the proud grandparents of two grandchildren.